Odin and Loki tromped up the road, weary and hungry from a long day of travel. They happened on a house, and decided to beg hospitality there. Odin knocked on the door. The housewife answered the door wearing a red scarf on her head and an apron covered in white flour. “We shall be good guests, if you be a good host,” Odin promised. They followed the goodwife into her kitchen. She had an iron griddle going on the fire, and a board and rolling pin. “Gertrude,” she said. She took a small piece of dough and rolled it out. Odin elbowed Loki in the ribs just a little, to get his attention, and then cast a small magic on the dough. As the human rolled out the dough, it grew and grew until it covered the whole griddle. She took a piece of dough so tiny they could scarely see it. Odin nodded shallowly to Loki and Loki tried the magic he had observed. This time too, the dough grew to fill the whole griddle. Loki suppressed a smile at having learned a new magic, resulting in a twisted smirk. Gertrude picked up her rolling pin to defend herself, but Odin only gestured at her, using magic. Then Gertrude shrank and became a woodpecker. Her red scarf was still visible in her feathers. She flew right up her chimney and got soot all over her, and her body became all black. 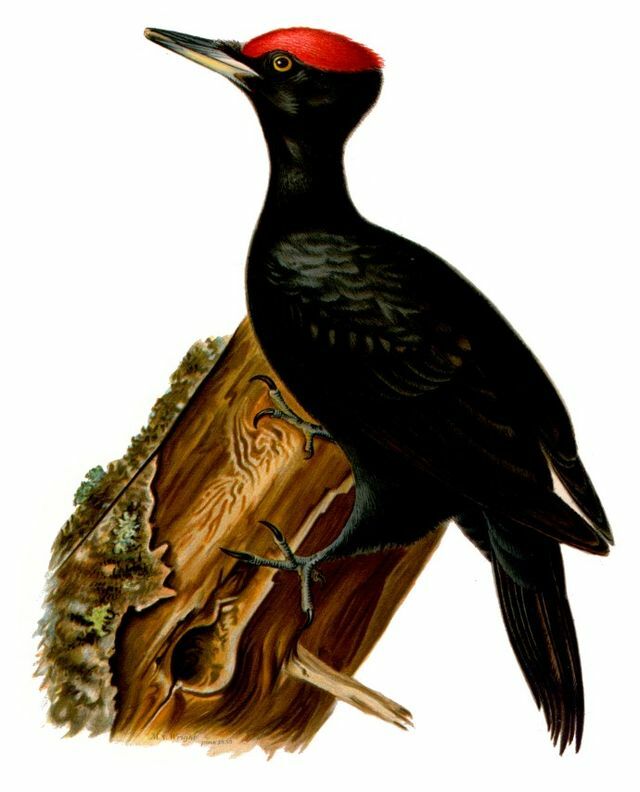 So the Gertrude Bird is a black woodpecker with a red head. She pecks at the boles of trees, and whistles when the rain is coming, for she is always hungry and thirsty. So Odin ate the first griddle cake, and Loki ate the third, and Honir manifested between them and ate the second pancake. Then they settled in for the night in Gertrude’s bed and had a fine night on the straw, and left her dirty sheets to sit until the neighbors found the empty house. In the morning Loki fixed bacon and eggs for breakfast from Gertrude’s pantry, and they went on their way, all three of them singing a happy tune as they set out of the road, each with an apple for walking and snacking. A black and red woodpecker drilled a tree beside the house as they left.